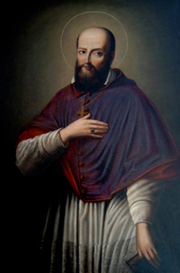 Francis de Sales, C.O., T.O.M., A.O.F.M. Cap. (French: François de Sales) (21 August 1567 – 28 December 1622) was a Bishop of Geneva and is honored as a saint in the Roman Catholic Church. Francis de Sales is currently considered a "single author." If one or more works are by a distinct, homonymous authors, go ahead and split the author. Francis de Sales is composed of 72 names. You can examine and separate out names.